Accessed via Wikimedia on 11 September 2018. Click here to view source. The topic of mountain nature conveys the relationship between nature scenes and their representation in literature and art. The relationship is a complex one. Alpine nature is conquered through literary descriptions of it. And Alpine literature, at the same time, prepares readers for further explorations, deepening humanity’s entanglements with nature. As a literary topic, Alpine nature is viewed through the lens of ambiguity, danger, and its eventual conquest and mastery. For centuries, the Alps were thought to be impassable and inhospitable. Apart from the occasional individual dwelling in a remote location—refuges used by goat herders on a seasonal basis—most people lived in Alpine valleys, in close proximity to a system of trails, or to a lake or river that facilitated contact with other human settlements and networks of trade and transport. An early form of Alpine tourism was the “Grand Tour” through the capitals of continental Europe. Starting in the seventeenth century, many sons of British and European elites embarked on such a trip to visit the cradles of Western civilization and classical antiquity. Mass tourism in the modern sense of the word dates back to the nineteenth century, when a system of rail tracks facilitated access to Alpine nature sites. The Semmering outside Vienna is the oldest railway that cuts through the mountains, and is now a UNESCO world heritage site. It was the Italian humanist Francesco Petrarch, however, who wrote the first description of a mountain ascent. In his narrative he mainly focused on his experience once he arrived at the summit and was able to enjoy majestic views over the lowlands. The description of Petrarch’s climb became the model for later mountaineering descriptions. With his narrative, Petrarch laid the foundation for the conventions that continue to guide literary representations of mountain ascents. After hiking through Alpine nature with his friend Salomon Geßner, Swiss-German writer Albrecht von Haller composed the first German-language poem that deals specifically with the Alps. Geßner is known for his pastoral prose and Haller’s Alpine poem makes ample reference to that literary tradition. In his novella about a mysterious rune mountain, romantic poet Ludwig Tieck frames mountain nature as an allegory for a place where dangers lurk but also great attractions abound. Readers of the tale are able to experience the romantic ambivalence toward the high mountains, looking over the shoulders of the characters and observing their struggle to decode the book of nature in a never-ending search for deeper meaning. Goethe’s dramatic character Faust, on the other hand, is a materialist. He seeks to understand mountain nature in its material essence and conducts a plethora of scientific experiments focusing on geology, weather, and atmosphere. Goethe himself was known for his interest in science and mountaineering. His scientific studies and literary pursuits complemented each other. The Austrian writer and painter Adalbert Stifter elevates the relationship between geology and literature to a poetic principle. In his fictional work, nature becomes an antagonist to the human protagonists. Stifter’s characters are trained field researchers. They translate their scientific findings into narrative descriptions of nature that include first inklings of a number of adverse consequences of the human entanglement with nature. Modern writers are less hesitant about addressing the devastating consequences of human-nature entanglements more openly and directly. In his science fiction novel, Berlin author Alfred Döblin addresses the problems with large-scale Faustian climate engineering schemes. Civilization is afforded a narrative voice that is rather critical of these schemes, and emphasizes their strangeness and destructive nature. The contemporary author Ilija Trojanow published one of the first German-language climate change novels, EisTau (2011), in English, The Lamentations of Zeno, about a former glaciologist who has become a lecturer on a cruise ship in Antarctica. The protagonist suffers both physically and emotionally from the death of the Alpine glacier that he had studied for many decades. Even though the glaciologist is implicated in climate change by his work for the cruise ship industry, the readers are nevertheless able to feel and experience his pain at the glacier’s death, and they suffer along with him. These literary portrayals of mountain nature, mountain ascents, geological exploration, melting glaciers, and polar environments not only mirror the scientific knowledge of the time but actively shape the narratives that we tell each other about this nature. 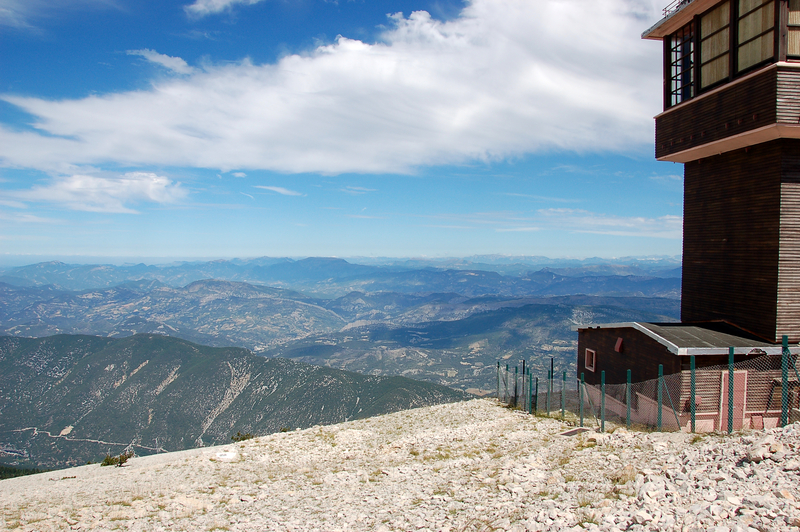 View from the summit of Mont Ventoux. Photograph by Mimova. I conceived the plan of some time doing what I have at last accomplished to-day. The Idea took hold upon me with especial force when, in re-reading Livy’s History of Rome, yesterday, I happened upon the place where Philip of Macedon, the same who waged war against the Romans, ascended Mount Haemus in Thessaly, from whose summit he was able, it is said, to see two seas, the Adriatic and the Euxine. —Francesco Petrarch, in James Harvey Robinson, ed. and trans., Petrarch: The First Modern Scholar and Man of Letters (New York: G. P. Putnam, 1898), 308. View from Mount Haemus (Haemus mons), Bulgaria. Photograph by Deyan Vasilev (Dido3). In contrast to people in the Middle Ages, Petrarch no longer considered the world a place that is merely a miserable station on humanity’s path toward heaven, but as a place that has its own validity and laws. This new and more secular attitude towards the world became the foundation of a new and radically different human attitude towards nature, particularly towards landscapes in which aesthetic and philosophical perspectives play an important role. At first, owing to the unaccustomed quality of the air and the effect of the great sweep of view spread out before me, I stood like one dazed. I beheld the clouds under our feet, and what I had read of Athos and Olympus seemed less incredible as I myself witnessed the same things from a mountain of less fame. —Petrarch in Robinson, Petrarch: The First Modern Scholar and Man of Letters, 313–14. This early document is evidence for the fact that in the Renaissance a very different, secular, and more modern knowledge about mountain nature was emerging, one that presented mountains as climbable and conquerable. The view from the top is a very powerful tool for mastery and conquest. Landscapes can be surveyed for miles on end and, with that knowledge, they can be owned. 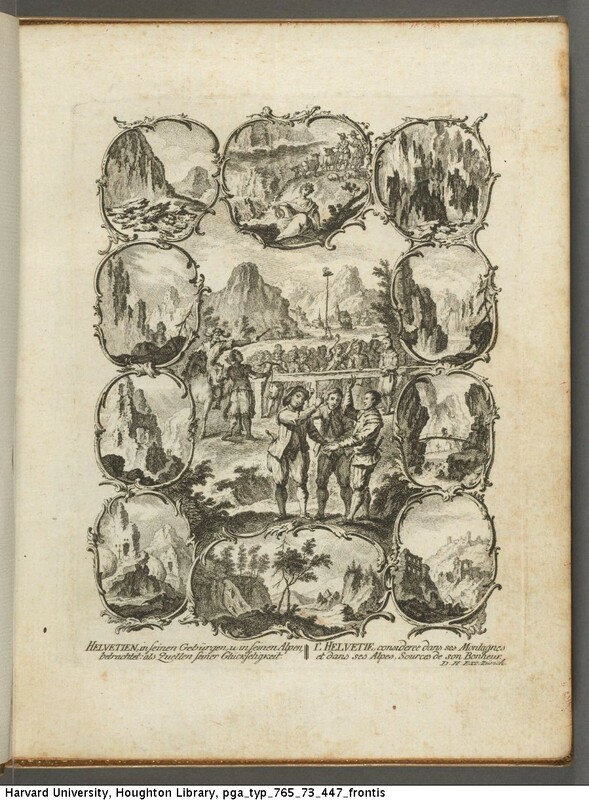 Frontispiece to Albrecht von Haller’s Ode sur les Alpes, 1773. Illustration by David Herrliberger. The Swiss-German poet Albrecht von Haller was the first literary author to represent the beauty of the Alps, in his 1729 poem of the same name. He composed the poem after a visit to the Alps, during which he explored their valleys and peaks with his Swiss-German friend Salomon Geßner. This long poem consists of forty-nine stanzas of ten lines, written in Alexandrine verse. His intent, it seems, was to convince an educated public of the beauty of Alpine nature. In this poem, Alpine nature—even though it is still perceived as threatening to a certain extent—is described as something that humans can conquer. Protect you still from man, man’s fiercest foe. —Albrecht von Haller, “Die Alpen,” (1732), in Poems of Various Kinds, trans. Edward Hamley (London: T. Cadell and W. Davies, 1795), online at Spenser and the Tradition. This attitude of increasing mastery over—and conquest of—Alpine nature is transmitted via literature. In fact, literature facilitates and builds on this. The conquest of nature and the literary and artistic representations of this conquest are two sides of the same coin. Mines, which Peru with envy might behold! Bare rocks are strewn with flow’rs, and soft the north-wind blows. The Alpine nature described in this poem has attracted many visitors, who have marveled at the picturesque high peaks, rugged glacial valleys, pristine mountain streams, and gushing waterfalls. Today, though, the subject of glacial melt, attributed to climate change, has become a regular part of tourist experiences of glacial environments, as well as characterizing many contemporary descriptions of Alpine nature. Among the many romantic literary texts that include mountains, one by the German romantic poet Ludwig Tieck sums up the romantic attitude towards mountain nature: his novella about the mysterious “rune mountain” (“Der Runenberg,” 1804). This novella brings together romantic attitudes toward mountains with the mythical character of Venus, who is said to reside in one of them. At the beginning of the novella, the young hunter Christian meets a mysterious stranger who tells him about the “rune mountain.” The conversation produces a longing in Christian and he decides to search for this mountain. He came into places he had never seen before; the rocks grew steeper; the green disappeared; the bald cliffs called to him, as with angry voices, and a low moaning wind drove him on before it. Thus he hurried forward without pause; and late after midnight he came upon a narrow footpath, which ran along by the brink of an abyss. —Ludwig Tieck, “Der Runenberg” (1804). Translation by Thomas Carlyle, online via Wikisource. 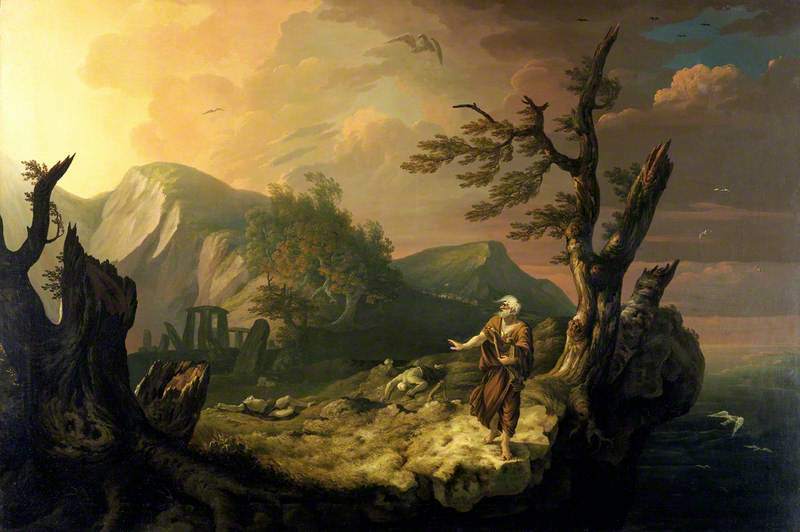 Thomas Jones, The Bard, 1774. Oil on canvas. Held by the National Museum Cardiff. He heeded not the depth which yawned beneath, and threatened to swallow him forever; so keenly was he driven along by wild imaginations and vague wishes. At last his perilous track led him close by a high wall, which seemed to lose itself in the clouds; the path grew narrower every step; and Christian had to cling by projecting stones to keep himself from rushing down into the gulf. As we can see from this passage, the romantic literary figures still hope to decipher the book of nature, but during the course of the story it turns out that the most inaccessible parts of the natural world contain a form of danger that no one, certainly not young Christian, is able to resist. It is these inaccessible areas of the mountains—their hidden caves and interior spaces—where unforeseen dangers lurk. 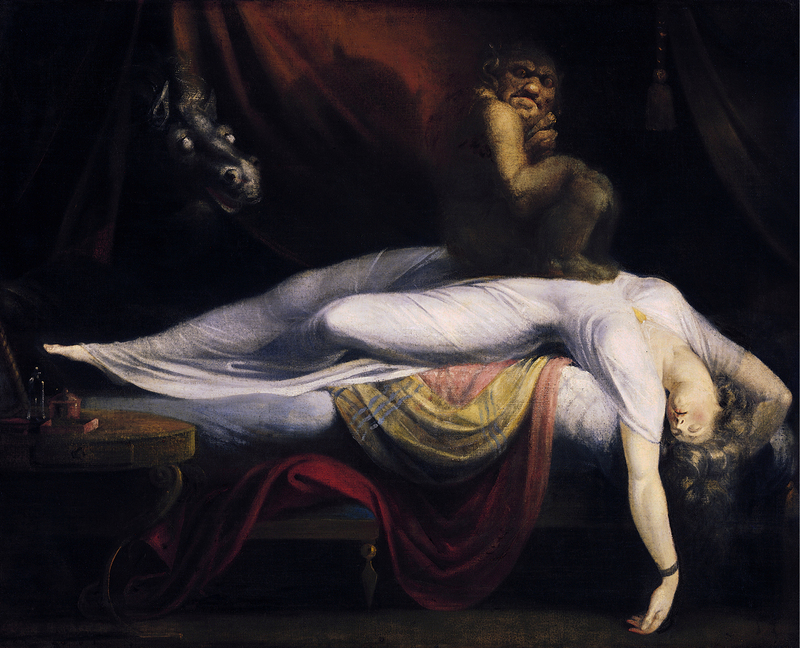 Henry Fuseli, Nachtmahr [The nightmare], 1781. Oil on canvas, 101.6 x 127 cm. Held by Detroit Institute of Arts. Accessed via Wikimedia on 11 September 2018. Click here to view source. Held by Detroit Institute of Art. 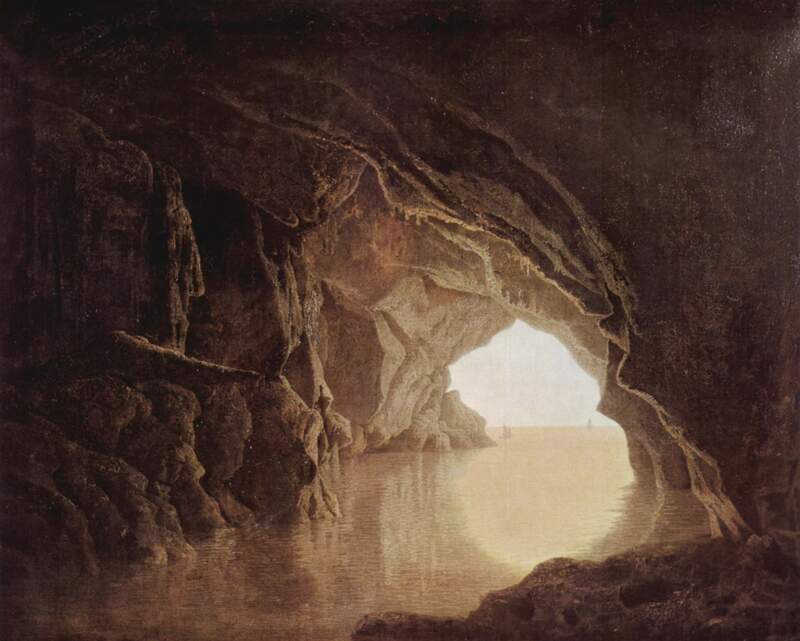 Joseph Wright of Derby, Cave at Evening, 1774. Oil on canvas, 101.5 x 127 cm. Held by Smith College Museum of Arts. Accesed via Wikimedia on 11 September 2018. Click here to view source. It is interesting to see how these caves and their perceived dangers are coded female. For the male characters that populate romantic tales, they contain both hidden pleasures and latent dangers at the same time. The romantic period makes this ambivalent attitude toward mountain nature one of its central concerns. Christian’s return to the rune mountain at the end of the novella, regarded from this perspective, constitutes a logical homecoming to a romantic nature—one that has subsequently been the subject of many artworks and musical settings. 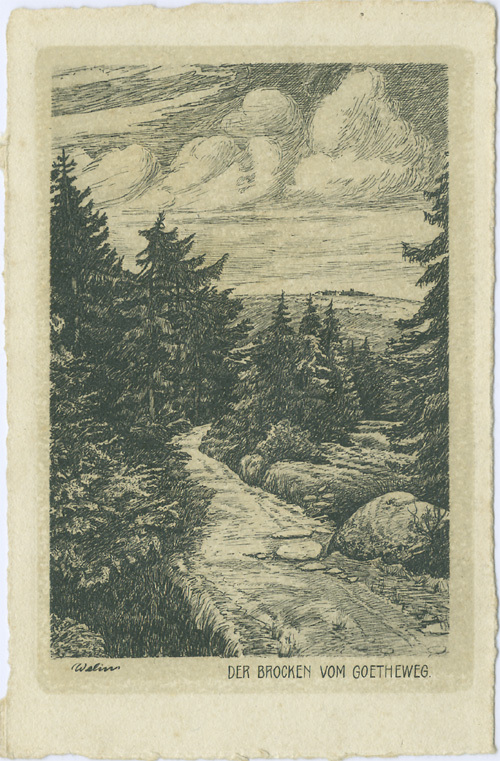 The Brocken viewed from the “Goetheweg” on a postcard. Accessed via Goethezeitportal on 11 September 2018. Click here to view source. —Johann Wolfgang von Goethe, in Goethe, The Collected Works: Scientific Studies, ed. and trans. Douglas Miller (New York: Suhrkamp, 1988), 146. Drawing of a German landscape. Johann Wolfgang von Goethe, 1810. A pleasure house in a pleasant place. With splendid gardens all around. —Goethe, Faust (1833), trans. A. S. Kline, online via Poetry in Translation (2003), lines 10160–3. 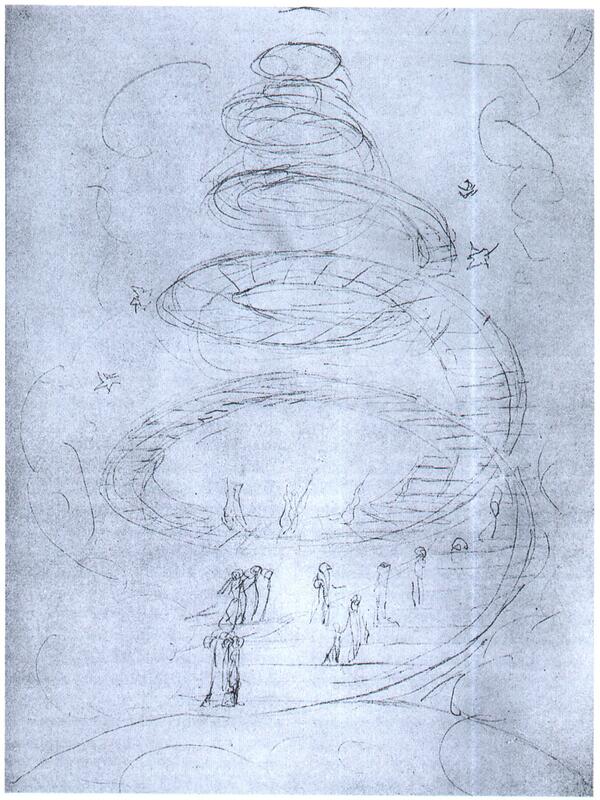 Illustration for Dante Alighieri’s Divina Commedia. William Blake, unknown year. 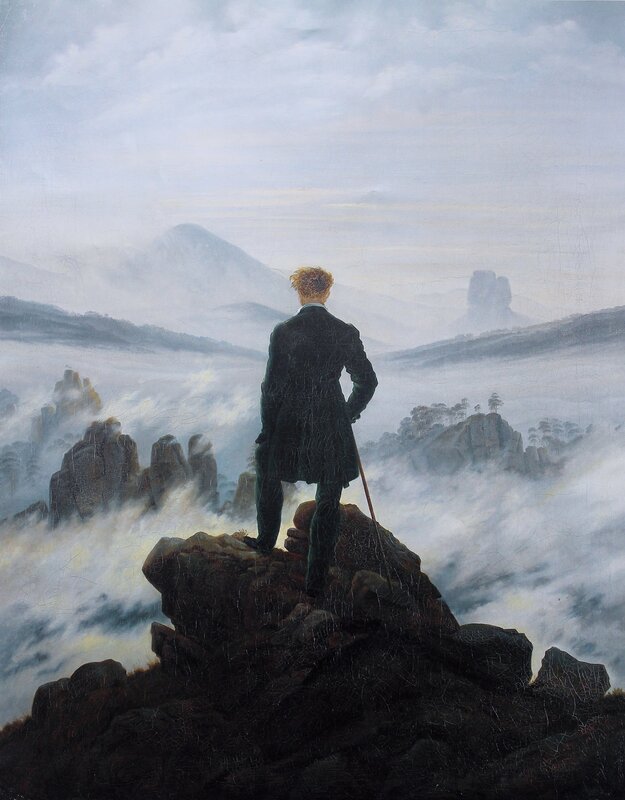 In act 4 of the second part of the tragedy, Faust retreats to a high Alpine peak in order to study and describe geologic and atmospheric phenomena from an elevated perspective. From there he seeks to investigate the light and other atmospheric phenomena that are of particular fascination to him, an episode that prefigures the ending of the play when Faust’s soul is rescued from Mephistopheles’s grip by the Angels that are able to transport Faust’s soul into the heavens, a scene that is depicted in a drawing by William Blake. Softly, through bright day, over land and ocean. 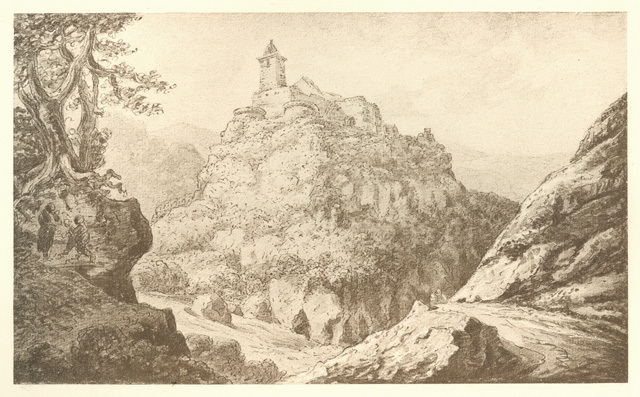 Several decades after Goethe’s Faust, Adalbert Stifter, Austria’s most prominent literary author in the nineteenth century, returned to the subject of geology and descriptions of mountain nature in his fictional works and paintings. 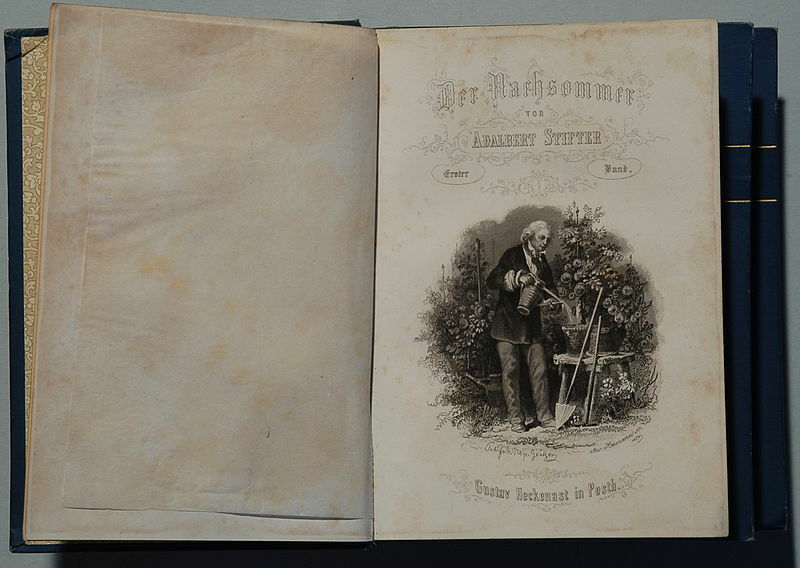 First edition of Der Nachsommer by Josef Axmann (1793–1873), with an illustration by Peter Johann Nepomuk Geiger (1805–1880). Photograph by H.-P. Haack. I worked more industriously and effectively than ever before; we examined cliffs along the stratification of their base in the valleys and at various higher points accessible to us or which could be made accessible with hammers and chisels. —Stifter, Indian Summer (1857). Trans. Wendell Frye (Lang: New York, 1985), 180. 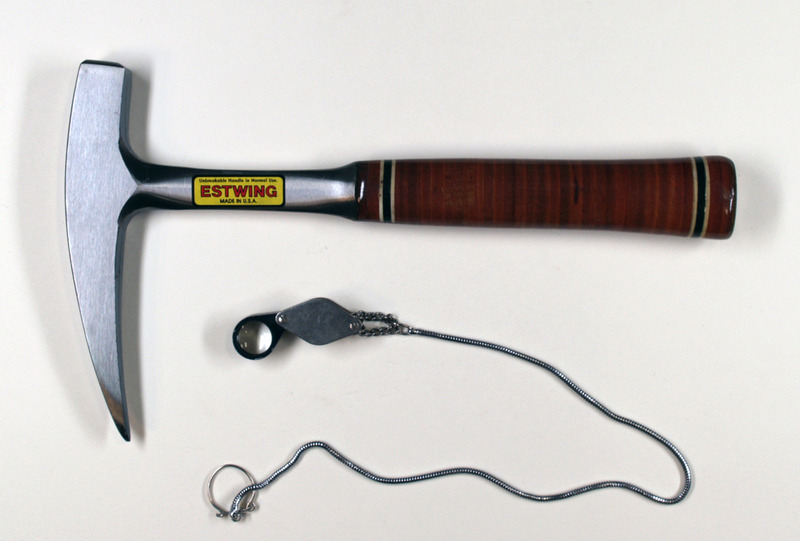 Tools of today’s geologist, a chipping hammer and a loupe. Photograph by Hannes Grobe, AWI. It is his study of geology and—following his work in the field—the discussions of his findings with his friends and co-workers, that lead Heinrich to his wife Natalie. Stifter developed the theme of geology through discussions with his friend, Friedrich Simony. Simony was one of the first modern geologists to utilize photography as a tool to provide visual evidence for geological data, which later developed into time-lapse photography and other data visualization techniques that are still used in today’s digital age. 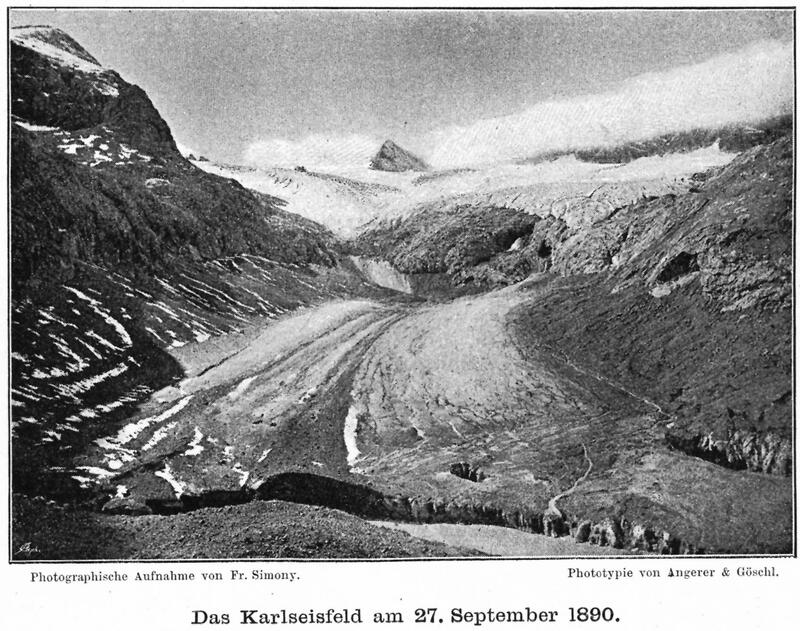 The Karls-Icefield on 27 September 1890. Photograph by Friedrich Simony. Accessed via Phaidra, University of Vienna, on 11 September 2018. Click here to view source. This work is licensed under a Creative Commons Attribution 2.0 Austria License. Whereas in the past year forests and cliffs had enclosed us and only a few places afforded us an open view, this year we were almost always on the open heights, and only in rare instances were we surrounded by cliffs or forests. Our most frequent companion in our work was the ice. Stifter’s fictitious characters are only able to make the most important decisions of their lives (in Heinrich’s case the decision about whom to marry) when afforded clear views of mountainous peaks and glacial valleys. In other words, nineteenth-century literature emphasizes the materiality of scenes of nature, and gives greater narrative agency to nature. Nineteenth-century literature was able to reconcile itself with anthropogenic interventions into the natural world, although the destructive consequences of these human-nature entanglements were beginning to register, at least in isolated instances. Stifter’s texts are evidence that the balance was beginning to shift. 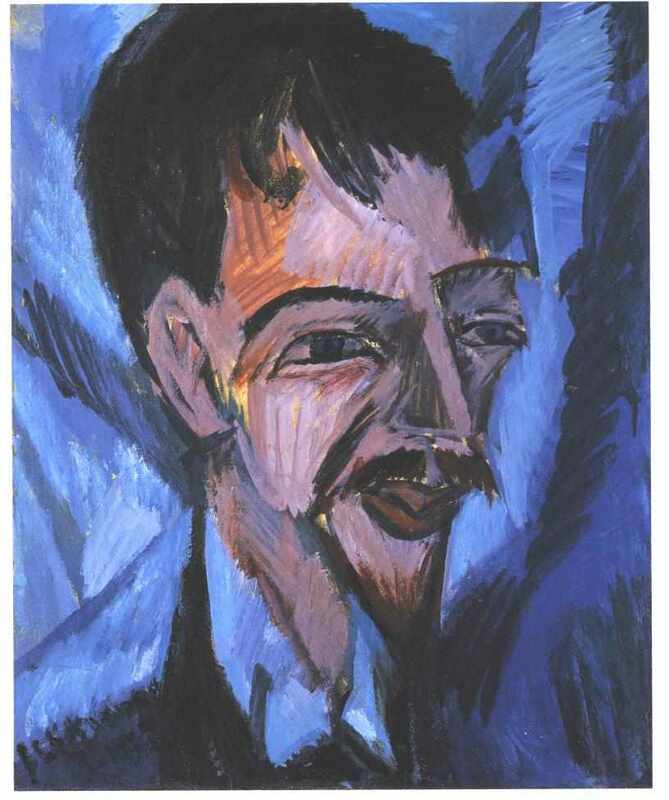 Ernst Ludwig Kirchner, Portrait of the Berlin author Alfred Döblin, 1912. Oil on canvas, 50.8 x 41.3 cm. Held by Busch-Reisinger Museum, Harvard University Art Museums, Association Fund. A novelist from Berlin, Alfred Döblin, was the first literary author in the early part of the twentieth century to address the subject of climate engineering. This is demonstrated by his epic science fiction novel, Berge, Meere und Giganten (Mountains, oceans, and giants), published in 1924. In the chapters about Iceland, and about the project of de-icing Greenland to harvest its enormous potential energy, the narrator of the novel assumes a planetary perspective, looking down on the future of human civilization. From this perspective, the world has been totally destroyed. All Western continents have been eliminated, a gigantic planetary war has been waged, Iceland’s volcanic energy has been harvested and stored on gigantic ships and Greenland has been de-iced. The technology of storing these vast amounts of energy in veils of tourmaline in order to feed the world’s hunger for power is applied successfully at first, only to later give rise to the reawakening of dragon-like monsters from earlier geological periods. As a result of the warming climate, these monsters now threaten all life forms in Europe. The experts had in mind letting the unique power of the melting glaciers work for them. They invented ever larger schemes; they did not want to stop with the de-icing of Greenland but envisioned climate change for the entire northern hemisphere. —Alfred Döblin, Berge, Meere und Giganten (1924; repr. Olten: Walter, 1977), 293. Translated by Sabine Wilke. 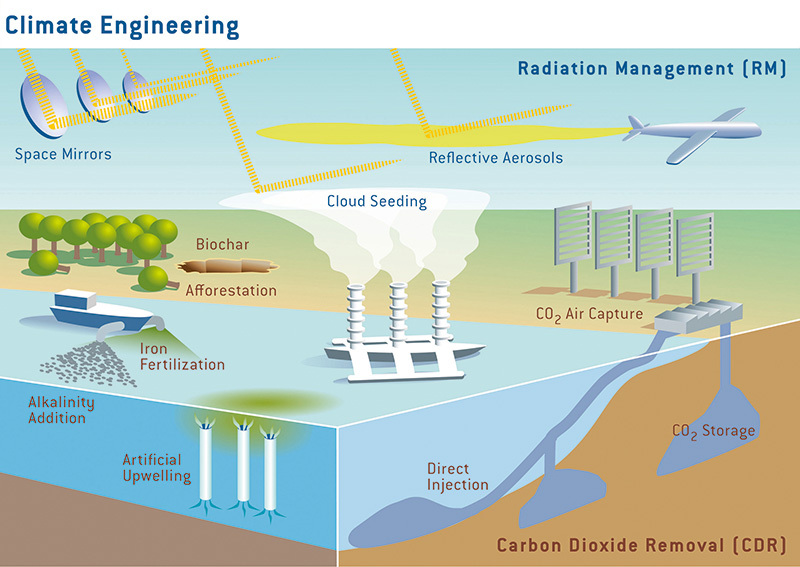 Diagram with various models of climate engineering. Graphic by Rita Erven, Kiel Earth Institute. Accessed via SPP Climate Engineering on 11 September 2018. Click here to view source. Off the northern coast of Scotland, wild and craggy rock islands were rising from the stormy sea: those were the gathering locations for ships, machines, people. The engineers, mathematicians, physicists, geologists and their assistants were concentrated in London Brussels. They were always wafting new plans over to the people, enticing them, exciting them. —Döblin, Berge, Meere und Giganten, 295. Translated by Sabine Wilke. 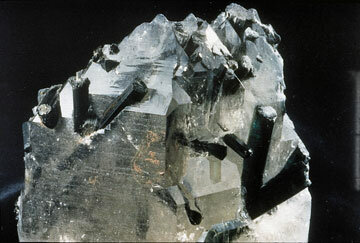 A specimen of the silicate mineral tourmaline. USGS, 2004. Energy storage becomes a poetic principle. The readers are inundated with literary images: these images no longer function as metaphors or allegories of the book of nature in the romantic sense, nor are they reminiscent of the literary images that populated the texts of the nineteenth century. The mountains, oceans, and giants of this early twentieth-century science fiction novel become the antagonists working against human civilization. Through these narrative features, non-human nature is given a literary presence and a new voice. This book makes it clear to its readers that the technological progress that made de-icing Greenland possible does not constitute a solution to destructive attitudes toward nature that are the cultural foundation of modern Western civilizations. 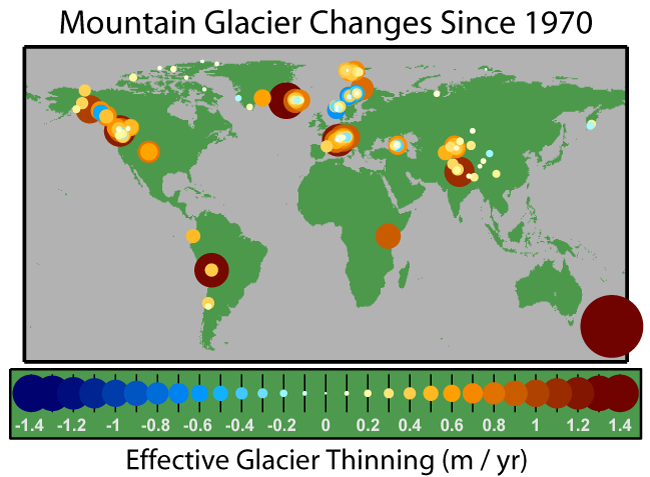 Mountain glacier changes since 1970. Graphic created by Rober A. Rohde as part of the Global Warming Art project. I’ve been watching it my entire life, with passionate care and precise instruments… . Whenever I stopped to catch my breath I would touch it, laying my hands on its flanks and then stroking my face, taking in its icy breath, its invigorating cold. I was familiar with every one of its sounds, the creaking and the clanking, every glacier has its own voice … We were like an elderly couple: one of us was severely ill, and the other couldn’t do anything about it. —Ilija Trojanow, The Lamentations of Zeno, trans. Philip Boehm (London: Verso, 2016), 44. 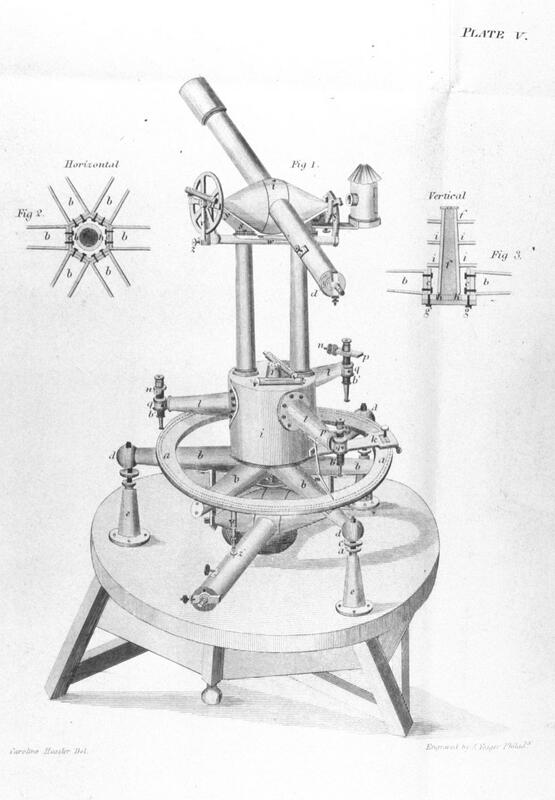 Illustration of a Troughton 24-inch theodolite. Caroline Hassler, 1820. Zeno Hintermaier takes his students to the glacier, and on each field trip he stumbles on the problem of shrinkage that “his” glacier is experiencing because of global warming. The situation becomes more and more alarming over time. We gazed down into the valley. From above, the effect of human intervention is quite visible, it’s easy to see what we have done to nature. That was hardly a revelation, even for the students conditioned by city living who didn’t know what an oxbow was. I wanted them to spend at least one afternoon seeing with their own eyes, consciously observing the shrinking fens, the straightened rivers, our civilization’s attempts to impose its own discipline on the natural world. —Trojanow, The Lamentations of Zeno, 49. The topics of glacial melt, global warming, and climate change are presented to the reader not only thematically, through a story that literally takes place on the melting Antarctic ice fields, but also through a narrative perspective that allows readers to empathize with the main character and feel his sadness when confronted with the topic of climate change. Zeno Hintermaier suffers from this condition physically and emotionally, even though he is, like all those who lead modern lifestyles, dependent on energy and resources. With the help of such a narrative perspective, however, literature like Trojanow’s novel can raise awareness of the psychological impacts of climate change on a broad number of people who may not have been persuaded by science to take action, demand stricter regulations, or change their consumption habits. Short video on romantic landscape paintings by Dahl and Friedrich, Albertinum Dresden (commentary in German).